Add comfort and color to your bedroom decor with this chic but simple blanket. Crafted from cotton with a high-quality knit construction, the blanket features a textured waffle weave that combines with the light weight to create a piece that is perfect for use in both the summer and winter months. 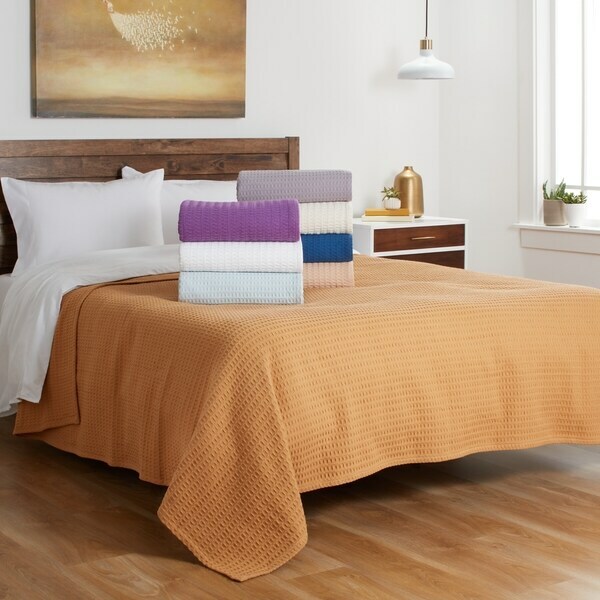 The cozy blanket comes in a variety of rich colors to coordinate with your decor. Thanks to someone else's review stating that the blanket came in more a lilac color than a grey color, I decided to ordered some. Yes, they are more purpleish than grey and I love them. The weight is great for the summer months. I was using another cotton blanket that had a looser weave and my two pomerians dogs were creating little pulled out threads. These blankets have a tighter weave and after a month of use, I do not see any pulled threads. I am pleased with these blankets. I selected the color gray, and the blanket is a nice color, more a medium than a heavy weight as the title implies. The cotton fabric is soft and comfortable. The weave is tighter than other blankets such as this that I've had in the past, but it is still loose enough to "pull" if caught on something, as it did because of my bracelet the first time I put it on the bed. All in all, though, considering price, I am pleased with the quality of this product. I love these blankets! They are great all year round and are durable. With all my cats and dogs the blankets handle the wear and tear and washing! They are the best and love the color choices. I ordered this in Lilac, King size. The color is beautiful and the blanket is a good woven quality. Directly out of the packaging it stinks, but this Is common with anything that has hit a dye lot overseas. the blanket is warm, but I wouldn't necessarily say heavyweight. I don't think it would be enough to solely be on the bed even In the summer time. My only issue is the size, and this seems to be across the board with king size blankets. its not long or wide enough leaving only an inch hang down on either side. Overall, good product, good price, happy consumer. I really like this style blanket. The texture and weight is great. However, it shrank about an inch in width when I washed it. Need to order one size up. This is a heavy duty blanket. It's not a soft, cuddly, wrap yourself in and watch a movie blanket. But it's very cozy if you put something soft between you and it. I washed it when I received it with plenty of softener and it's still a bit rough, but I expected that. It feels substantial and I believe will be perfect for winter, combined with my new alternative down comforter (super soft and comfy). The color is true (mine the deep plum). I say if you're looking for a splash of color and blanket that will keep you warm, go for it. Is not as nice as i'd hoped. Yes it is heavy weight. I like the blue color, too. The fabric feels like cheap cotton rather than fine cotton. The size is a few inches less than what was advertised. I'm still using it on the guest bed, though. Well over 10 years ago I purchased a waffle weave blanket from Overstock. Still using it after 30 washings but the color is dated. Have been searching for this blanket and at last I found it. It has been dog tested. It doesn't snag and it washes well. Am buying another one. Had purchased 2 other waffle weaves and they were not the same. This one is the real thing. Buy in a confidence. Blanket is what I hoped for. Very well made. I specifically bought one size larger than bed size so when I washed and dried it the shrinkage would allow me to still use the blanket and it did shrink but fits perfectly for my purposes. Very good Knitted Waffle Weave Cotton Blanket!! This blanket is soft and warmer than most because of the strong weave. The ivory color is nice. I recommend it. First, I'm very happy with my purchase. I bought navy and white. I wanted cotton blankets with a nice weave. These are great. Second, I'm realistic and worked in clothing retail for many years so I was prepared for this: Straight up, it reeked of formaldehyde. I had to wash several (4) times before using due to it being treated, it's a natural fabric so it's prone to mold and pests during shipment. I get it. After laundering with oxiclean and natural detergent and vinegar they no longer have ANY chemical smell. Lovely product, I will buy again and again. Even though it is described as heavy it is not. I suffer from Hot flashes and this is perfect for me. I love a heavy blanket, and this one fits the bill. The waffle weave cotton allows for air movement, but the construction of the blanket makes for a wonderfully snuggly nights sleep. I would recommend this blanket to anyone looking for a great blanket. Blanket is just fine despite the low cost. Would recommend to a friend. WEARS WELL, we have used 4 of these in a heavily scheduled spa and they hold up to constant washing well. This waffle weave cotton blanket is beautiful and so soft. It was a great price, delivered so quickly and washes beautifully. It could not be more comfortable. It is great for summer as well as winter because it is made of 100% cotton that feels good all year long. Could not be happier with this purchase. Great color also in ivory--it goes well with everything! I am giving this lovely blanket only four stars. The the blanket arrived in a plastic zippered case that was so brittle it shattered when the package was opened. The blanket however is in perfect condition. It would have been nice to be able to use the case for storage purposes. Maybe the enclosed blanket was exposed to heat, I do not know. Over all I am very happy with this purchase, minus the brittle case it came in. I would recommend this product. Nice, think, warm, and well made. Love this blanket and it can also double as a bed spread. Washes well and has held up for several months with no pulls. Pretty color but not soft to the touch - even after several washes. Warm and soft blanket. Covers the sides nicely. Great layering blanket. Just enough warmth in the summer and perfect underneath a quilt in the winter when extra covering is needed. Only issue is that it stretches a little when in use and can result in an overhang on one side. "Has anyone used this blanket during the winter months? I'm really looking for an acrylic blanket for my full size bed. Haven't been able to find any, so I guess acrylic blankets aren't made anymore." "Does anyone know the weight of this blanket - actual weight in pounds and ounces? I have a friend who needs a blanket for therapeutic reasons. Thanks!" "snow flakes, blue heavy ,"
It is a heavier thermal blanket. Not sure about snowflakes. I'd call it mid weight. Not heavy, but not thin either. Cotton, so it breathes. Nice heavy.. just perfect for me.. Bought 2 of them ! "Do you know the weight of these blankets? Like how much the twin blanket or king blanket weighs?" I have no idea what those sizes would weigh. Mine are Queen size and I feel they are a heavyweight blanket. My husband is bedridden and he loves them. They have been washed at least 20 times and hold up very well. I don't know the weight, but I can tell you that if it's what I'm thinking you want to use it for, this is not heavy enough. I need to sleep with a weighted blanket and mine is queen and I have to fold it in two in order to feel a bit of weight. "Reviews from 2014 said the grey had a purplish hue to it. The picture of the grey looks grey but I was wondering if you still felt it had a light purple tint to it? Thank you." Do not believe it has a light purple tone. Have washed several times and it is a clear light gray. It has shrunk considerable although I tried to b e careful in dryer. Mine is king size. "My bed is cal king, will the king cover?" The standard King is 76 inches wide by 80 inches long. A California King size is going to be 72 inches wide by 84 long making it the longest possible mattress, but it is 4 inches narrower, It will not fit perfectly, but will be a close fit. "I'm looking for the blanket in king size ivory color. When will you receive more in?"